University of Wisconsin Press, 9780299301248, 290pp. During the early 1880s a continual interaction of events, ideas, and people in Ireland and the United States created a "Greater Ireland" spanning the Atlantic that profoundly impacted both Irish and American society. 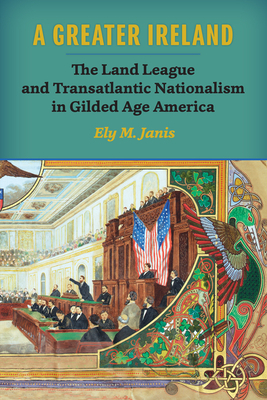 In A Greater Ireland: The Land League and Transatlantic Nationalism in Gilded Age America, Ely M. Janis closely examines the Irish National Land League, a transatlantic organization with strong support in Ireland and the United States. Founded in Ireland in 1879 against the backdrop of crop failure and agrarian unrest, the Land League pressured the British government to reform the Irish landholding system and allow Irish political self-rule. The League quickly spread to the United States, with hundreds of thousands of Irish Americans participating in branches in their local communities. As this "Greater Ireland" flourished, new opportunities arose for women and working-class men to contribute within Irish-American society. Exploring the complex interplay of ethnicity, class, and gender, Janis demonstrates the broad range of ideological, social, and political opinion held by Irish Americans in the 1880s. Participation in the Land League deeply influenced a generation that replaced their old county and class allegiances with a common cause, shaping the future of Irish-American nationalism. Ely M. Janis is an associate professor of history at the Massachusetts College of Liberal Arts. "Impressively researched, A Greater Ireland makes a major contribution to Irish-American, immigration, and nineteenth-century U.S. social and political history. "—David Brundage, coauthor of Who Built America?